The Life Fitness Platinum Club Series Discover SE FlexStrider is the latest invention of the Life Fitness line of the Platinum Club series. The high-quality materials, innovative technology, and modern design characterize the equipment. The high-quality FlexStrider is a full-value and optimal training partner for ambitious sportsmen who want to combine walking and running. Thanks to the latest technology Variable Stride Trainer, you have the possibility to switch between short walking step and long running step by adapting your speed and stride length by changing your step. The FlexStrider guarantees a joint-gentle though intensive whole body training by an extremely soft course of movement and natural stride length. The special offer package of the sturdy FlexStriders is enriched by the low space (6.3 cm) between the extra-large treads. It minimizes the lateral hip movement and provides thus an excellently elliptical movement. Besides innovative technology and modern design, it is focused on training comfort. Due to the resistance control of mobile arms, you can easily adjust the training intensity without interrupting the training. Thanks to the low pedal height of just 22 cm, you can easily get on and off the comfortable FlexStrider. You are looking for a high-quality training equipment for doing an efficient whole body training with a lot of fun? The FlexStrider offers the combination of outstanding quality, highest training comfort, and varied entertainment and program features. The Life Fitness Platinum Club Series Discover SE FlexStrider is available with the well-known Discover SE and SI consoles. The consoles of the FlexStrider are equiped with the smart Fit Power, which calculates your speed, resistance and also your stride length now. By means of the data, you can control your training intensity by adapting your stride width, resistance or speed. Benefit from wide-range entertainment and training programs with the Discover SE console. Browse in the Internet via WIFI, watch your favorite TV series, use media of your Smartphone (i.e., music) or social networks while exercising. Thanks to LF Connect, you can personalize and administer your equipment. The console SE offers the possibilitiy to create and save up to 8 individual programs, the number of user profiles is unlimited. The FlexStrider guarantees an entertaining and challenging whole body training. Experience fascinating outdoor adventures with the interactive training software LifeScape - you run or walk shot distances. The resistance of the FlexStriders adjusts automatically to the video landscape, so that you can admire the fascinating environment and keep motivated. Control all determined training data with the Life Fitness LC Connect App in order to achieve your personal goals. The Discover SE console is also compatible with further Apps as i.e. Jawbone App, Rustastic App or Fitbit App. While improving your health by exercising on the high-quality FlexStrider, the integrated mat protects your floor and serves as visual barrier for the whole floor space. Be inspired by the excellent combination of approved quality, innovative technology, and highest training comfort of the FlexStriders. 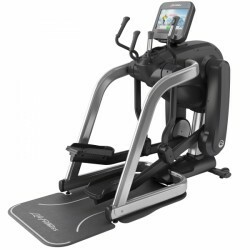 Life Fitness Platinum Club Series Discover SE FlexStrider add to comparison list.